(iii) Rakesh Jhunjhunwala decreased stake in CRISIL LTD and Rallis India Ltd.
(iv) Stake in Fortis is increased. Rakesh Jhunjhunwala, popularly known as the Badshah of Dalal Street, needs no introduction to us. He is a self-made Billionaire with a net worth of $2.4 Billion according to Forbes. Of this, approximately Rs. 13,186 crore is invested in Indian stocks listed on the BSE and the NSE as of 4th February 2018. The astonishing aspect is that Rakesh Jhunjhunwala started his career as a trader and investor in stocks a few decades ago with only Rs. 5,000 as his net worth. He has demonstrated incredible skill and talent in being able to convert such a paltry amount into a massive fortune of USD 2.4 Billion. Rakesh Jhunjhunwala was born on 5th July 1960 and is presently 58 years old. His father was an Income Tax Officer. He did his BCom from the Sydenham College. He is a qualified Chartered Accountant from the Institute of Chartered Accountants of India. Rakesh Jhunjhunwala is married to Rekha Jhunjhunwala. He has three children. He is known to be very close to his family and spends quality time with them after the trading hours on the stock market. Forbes has certified that Rakesh Jhunjhunwala is the 53rd richest man in India. His net worth has been estimated at USD 2.4 Billion. Much of the net worth is invested in stocks of listed and unlisted companies. The investment in listed companies is estimated at about Rs. 13,000 crore. There are also investments in real estate, including a palatial house in Mumbai and a farm house in Lonavala. Rare Enterprises is a partnership firm formed by Rakesh Jhunjhunwala as an investment vehicle to invest in stocks of listed and unlisted companies. Rare is also a vehicle by which partnership opportunities are offered to deserving persons who demonstrate exceptional ability such as Utpal Seth and Atul Suri. Titan Company is one where Rakesh Jhunjhunwala has the maximum conviction. He holds stocks worth nearly 6,200 crore and this comprises of nearly 47% of the total portfolio value. The other high conviction stocks include CRISIL, Lupin, Escorts, NCC, DHFL, Delta Corp and Federal Bank. There are also a number of low conviction stocks where the allocation of funds is not significant bearing in mind the size of the portfolio. Rakesh Jhunjhunwala’s latest stock picks includes Firstsource Solutions Ltd, an Infotech company. He bought 2 crore shares of Firstsource Solutions in the December 2017 quarter. He also added to his biggest holdings like Titan Company Ltd and Lupin Ltd.
Rakesh Jhunjhunwala teamed up with Radhakrishnan Damani to bid for Binani Cement, a company which is facing bankruptcy proceedings from its lenders. In December 2017, Rakesh Jhunjhunwala bought equity worth Rs 180 crore in gaming startup Nazara Technologies. This is his first foray into the e-commerce and digital space in India. Rakesh Jhunjhunwala has bid for Star Health & Allied Insurance, the first stand-alone health insurance company. Star Health & Allied Insurance carries a price tag of $1 billion. The company has also received bids from Azim Premji-led PremjiInvest, besides six other companies who are eyeing the insurer. Bids were received from Kedaara Capital, WestBridge, Temasek and Prudential and strategic investors including ICICI Lombard and HDFC General Insurance. He reduced holdings in Fortis Healthcare, Jubilant Lifesciences and Aurobindo Pharma. In the September 2017 quarter, Rakesh Jhunjhunwala had reduced his holdings in Federal Bank, Karur Vysya Bank, Tata Motors DVR and Delta Corp.
Rakesh Jhunjhunwala has bought 10 lakh shares of SpiceJet in February 2018. The stock has been a multibagger for him. His Rare Enterprises first bought 75 lakh shares of SpiceJet on November 28, 2014, at an average cost of Rs 17.88 per share. SpieceJet is now quoting at Rs. 141. The portfolio has performed quite well in 2017 with some stocks giving a return in excess of 200%. Geojit Financial Services gave a gain of 206 percent. 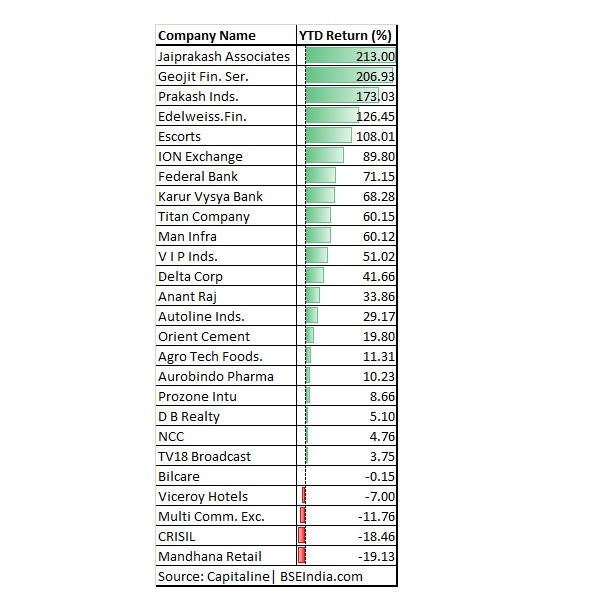 Jaiprakash Industries gave a gain of 213 percent. 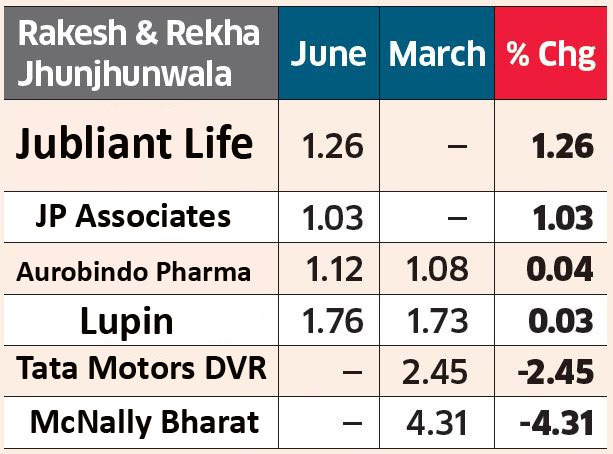 Other stocks like Edelweiss Services and Escorts gave a gain of 126 percent and 108 percent respectively in the same period. Titan Company gave a return of 161%, Delta Corp Ltd shares which returned 170%, shares of Dewan Housing Finance which surged by 142% and shares of Escorts Ltd which zoomed 158%. In an interview to Outlook, Rakesh Jhunjhunwala revealed his stock-picking mantra. He stated that he looks at growth, valuation, liquidity, and the company’s cash flows. “I pay a price for picking the wrong companies too. When I buy companies, I am adopting them. If they don’t deliver, then I have made a mistake in choosing them. It is true that some companies approach me, which I assess. Others, I choose,” he said. He also stated that when he believes in a story, he backs his conviction with large sums of money. He also revealed that one should not be dogmatic. “Not being dogmatic has helped me become a better stock-picker. You have to accommodate others’ point of view,” he added. Kalpraj Dharamshi, one of Rakesh Junjhunwala’s friends revealed that he always takes contrarian calls, because that is where the opportunity lies. If a stock has been discovered by the market, then the valuation will reflect that. In another interview to CNBCTV18, Rakesh Jhunjhunwala revealed that what sets him apart from other investors in the stock market is the ability to take risk. “One thing which keeps me apart is that I have got guts. I may have Rs 1,000 in my bank but if I think the deal is worth a crore – I will do it. I have guts and setbacks don’t put me off. I feel them for 10 minutes but then I am ready to fight back,” he explained. Rakesh Jhunjhunwala revealed that he admires the investment abilities of Stanley Druckenmiller, the top hedge fund manager. Stanley Druckenmiller ran a hedge fund named ‘Duquesne Capital Management’. The fund had a stellar record, with an average annual return of roughly 30% and no single money-losing year on record. Stanley Druckenmiller’s net worth stands at $4.7 billion as of date. 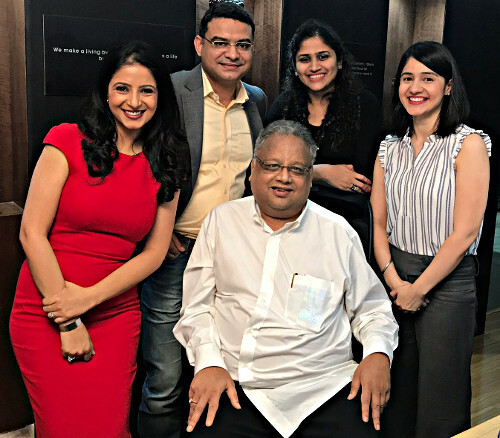 Rakesh Jhunjhunwala has made it amply clear on a number of occasions that he is desirous of donating a large part (in excess of 50%) of his wealth for charitable and philanthropic activities. He is a generous contributor to a number of charitable institutions. He personally sponsors the education of nearly 400 school going children who come from a disadvantaged background. In an interview to ZEETV, Rakesh Jhunjhunwala confirmed that he will donate 25% of his net worth o charity. Mini Menon of Live History India described Rakesh Jhunjhunwala as the “Amitabh Bachchan” of Dalal Street for his incredible achievements. The duo had a free-wheeling discussion of the contribution that marwaris have made to the Indian stock market and what makes them such successful investors. – Deutsche Bank has recommended a buy of Titan Limited for the target price of Rs 625. Titan Ltd is the flagship of Rakesh Jhunjhunwala’s portfolio. He holds more than 8.3% of the Company’s equity capital as of 30th June 2017. Titan has given a return of more than 84% on a YoY basis as compared to BSE Sensex return of 18.7%. Titan’s June quarter net profit has almost doubled due to a significant increase in jewellery demand. The net profit increased to Rs 237.97 crore in the three months ending 30 June, 2017, as compared to Rs 120.89 crore in the same period a year ago. In his latest interview to ETNOw, Rakesh Jhunjhunwala has offered tips to investors on how to find multibagger stocks. “The most critical decision is price. While it is important what we buy, it is more important at what price we buy,” Rakesh Jhunjhunwala said. He gave two examples to illustrate the tip. In 1999, he bought 55% of United Spirits and United Breweries for a paltry sum of Rs 6 crore. The stocks were cheap because Vijay Mallya had a dubious reputation even then of being a “thief” and of siphoning off funds from his companies. The concerns about Vijay Mallya’s management had destroyed the valuations of United Spirits and United Breweries to such an extent that they were quoting at throwaway valuations. Rakesh Jhunjhunwala realized that he could buy 55% of India’s liquor industry at a valuation of Rs 100 crore. This meant that the entire liquor industry in India was being valued at Rs only 200 crore. Obviously, the valuations were ridiculous. The value of the investment in United Spirits and United Breweries today is Rs 2000 crore. Rakesh Jhunjhunwala explained that there is a direct co-relation between the size of the opportunity and the growth prospects of the stock. Infosys is an example of this. The rapid growth of the internet gave Infosys the opportunity and means to also grow at a rapid pace. The mere fact that there is a huge scale of opportunity is not sufficient if the management does not have the vision and the ability to capitalize on the opportunity, Rakesh Jhunjhunwala emphasized. He cited the example of Mastek to illustrate how poor management can squander away all chances to make it big. Though Mastek and Infosys were born on the same day and had the same advantages, Infosys grew to be a behemoth while Mastek is still a small company. “The return on a Maruti should be that of a Mercedes,” Rakesh Jhunjhunwala said. He also advised that we should invest in those small-caps which stand chance of becoming large-cap stocks in the foreseeable future. Rakesh Jhunjhunwala advised that the analysis of the stock should be confined to important aspects of working capital cycle, capital intensity and the integrity of the management. He also pointed out that he does not overanalyze a stock. He decide on an investment in one hour even if there are unanswered questions. Rakesh Jhunjhunwala emphasized that investors who expect their stocks to turn into multibaggers overnight are making a big mistake. He explained that usually investments test the patience of the investor and lead him to doubt whether he has made a wrong investment. He cited Escorts as an example of where if investors have the patience and ability to hold on for long periods of time, multibagger gains can ensue. Escorts surged from Rs 125 to Rs 850 even though for two and a half years, it did nothing. Investors must have conviction, patience and luck, Rakesh Jhunjhunwala advised. 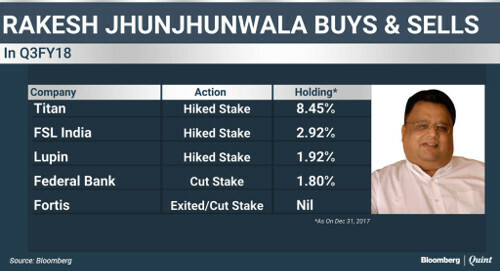 Excellent reports on Mr Jhunjhunwala. We salute and congratulate to Mr Rakesh Jhunjhunoo on his tallent. He is an ideal man. Good report. But will help if you put the date his Portfolio or date of updation. Else he sells & we buy !! Sir is really wonderful person. I feel very happy and very proud about him. 2018 is for JAIPRAKASH ASSOCIATE which is already reflecting in his portfolio on top. Debt Restructuring is the key and the smart investor’s buys the key to success. we should salute him. will he share his trade secret? how to choose stock? Realy a Great man and his contribution to the school going children touch to the bottom of my heart….. we all are proud of him. He is an institution to the Indian Stock Exchang. Great Personality and God bless him and his family,and wish him to continue his charity works in big ways. Very informative it definitely helps ordinary investors to have guidance where to invest , how long to keep invested and gain confidence to generate substantial profit from the investment. Mr RJ, pl keep it up , continue growing and pl look into disadvantaged school going children . God bless you . Best thing i observed and learned from seeing this portfolio is to buy stocks with less price and in much volume so that chances of earning are more. Thats exactly what i think in trade. Theres highest share with price of 1046.55 of luping, theres no any stock for bajaj-auto or bajaj-finserv ,infosys or reliance any other famous company in which generally all users trades, impressive. I share your view. Best wishes to you. Wonderful knowledge of trade.salute sir. Really Badshah of stock market. Wonnderful sir. You are an inspiration to the investors and a nice person too. Great Human being. If everyone Indian think like him, then there is no poverty in India. India will be BPL free country. I salute to him. GOD WILL grace & bless him.This is my pardon to GOD. I salute to you sir, for your achievements and philanthropic activity of supporting schools. your indian warren buffett, your not giving money to school going children , your making 400 great chanukays . I am salute you sir,but I don’t have know correct word sir, your man with lord laxmi face sir. When I think about share market, I remember Rakesh ji. He is “GURUDEB” of share market.I will be happy to see him as SEBI CHAIRMAN ever. I am novice to Stock Market and feeling lucky that I landed here. Namaskar Sir. Salute to your great work that u do for deprived people.GOD BLESS YOU. Just Follow the Rakesh Sir portfolio, i think that will enough for you. RESPECTED SIR RAKESH JHUNJHUNWALA SIR, GOOD EVENING TO YOU.HETE IS S.V.HARNOL DHANGAR FROM AHMEDABAD CITY GUJRAT,.REALLY YOU ATE YHE GOD FSTHER OF STOCK MSRKET.YOUR MIND SET,YOUR THINKING PROCESS,IS SUPER DUPER.YOU ARE WITH A GOLDEN HEARTED N HOLLY SOUL PERSONALITY.FOR ME YOU ARE ALWAYS A TOP SECRECT,TO WHOM AM ALWAYS TRY TO KNOW,MY LEVEL BEST.YOU ARE JUST A MAGNETIC PERSONALITY. GOD CREATE YOU TO HANDLE THE INDIAN STOCK MARKET ONLY. THE GREAT ALMIGHTY GOD JEJURI KHANDOBA ALWAYS BLESS YOU N YOUR FAMILY MEMBERS. Kindly advise on buying good midcap stock for long horizon. Thankyou verymuch for your portfolio details and it wil be a useful guidance for investors. Awesome portfolio of stocks. I have personally hold some of the shares also. Hi Sir Yr Portfolio is Very Very Strong!!!!!!!!!!!!!!!!!!!!!!!!!!! Congrats sir, I have listen many sessions on TV. Sir, There are some Bad Picks I think so like TV18, DB Realty, Lupin and Otherwise Escorts, DHFL ,Viceroy Hotels and Titan are a Excellent Picks. You Should Add This Stocks Which I am Suggesting You Indian Hotels, HDFC Standard Life, Future Consumers and BPCL For Medium Term To Long Term for 4-5 Years You Get Great Returns. You are proud of India. Salute Sir. Hi all fans i am new to shares lucklily landed here can see that Rakesh sir is down to earth person so only there are so many fans. 1. What ever the portfolio is published above is this is the latest portfolio? 2. Is there any other place or website where latest portfolio of Rakesh sir is published or am i at correct place? 3. Where can we get updates when Rakesh sir posts something about portfolios? Please correct me if i am wrong some where. Rakeshji has always been a down to earth person. No doubt, he is the Warren Buffet of India. We are proud of you Sir! What is more heartening is the allocation of 25% of the net worth for philonthrophic activities. Hats off to you Sirji! !